Lake Manyara is a small but very scenic Park renowned for its excellent bird-watching opportunities and the legendary but rarely seen tree-climbing lions. The 330 km² Lake Manyara National Park is situated in northern Tanzania. Small but extremely scenic, the Park is about 125 km west of Arusha - about a 2.5 hour drive away. During the wet seasons (November/December and March to May), the lake itself can cover up to 60% of the Park's total area - a vast 231 km². During these months, the lake's high alkaline waters attract a variety of migratory waterbirds, including huge flocks of pink flamingos as well as pelicans, storks and cormorants. During the dry seasons, however, the lake can dry up considerably. The Park is renowned for its excellent bird-watching opportunities in general, as more than 400 different bird species have been recorded. 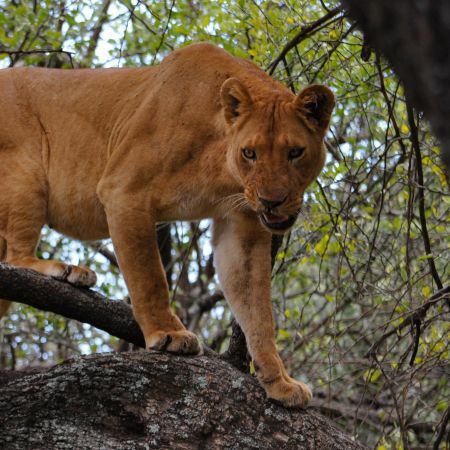 Other wildlife includes elephant, buffalo, cheetah, hippo, Masai giraffe, wildebeest, impala, zebra, warthogs, large troops of baboons, and the legendary but rarely seen tree-climbing lions - yes, they really do climb trees! As well as the lake, there are waterfalls, jungle-like groundwater forests, acacia trees, huge baobab trees, grasslands and swamps, all which make for a very pretty backdrop for your game and bird watching. The Lake Manyara Boardwalk trail meanders 300m through to the lake, and gives visitors a unique view and wonderful photo opportunites along the route. Educational signage at key points further enhances the experience! For the braver tourist, check out Tanzania's only Treetop Walkway too, giving you a birds-eye view of the area. You can comfortably visit the Park en-route to or from your safari in the Serengeti and Ngorongoro Crater. The driving trail loops in a horseshoe shape around the Park, and can easily be covered in a few hours. There are a handful of lodges in the area which offer a fully-inclusive safari experience, including all meals and guided game drives. Migunga Forest camp offers 19 semi-luxury tents, all tastefully and simply furnished, and with a large attached bathroom set underneath a canopy of acacia trees. The tents each have their own raised platform with its own private veranda, allowing very personal privileged view of the surroundings. Each of the 10 suites is a lofty tree house with a private veranda and large windows that open up to the lush forest, welcoming in the sights and sounds of the African bush. Woodchip paths and natural branch railings blur the edges between the natural and the manmade, while wooden interiors and thatched roofs invite the surrounding forest indoors. The 67 rooms are housed in circular, double-storey, white-washed 'rondavals' (traditional circular buildings with conical thatched roofs), which are strung out along the edge of the cliff so as to allow for maximum views. Each spacious circular room has its own small veranda while the interior décor reflects the blue of the lake and the pink of its flamingos. Each suite has its own spacious private veranda and viewing deck, with en-suite bathrooms that have slipper baths with views over the highlands, inside and outside showers and double basins. The 2 bedroom Villas also offers panoramic views of the surrounding area.